At first glance, this professional text is another resource teachers are unlikely to have the time to peruse, both due to teaching’s endless workload and because such texts are often cumbersome. However, this is one worth reading. 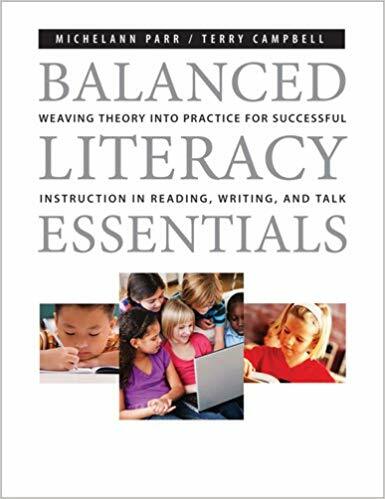 The authors present an approachable and practical account of what an organized and comprehensive “balanced literacy” program might include. In ten chapters, Parr and Campbell have delineated a clear path to their program; however, they do not do this by overprescribing the exact materials, methods, or even prompts (words) teachers should use. Instead, they offer clearly-focused chapters in a format that affords readers the ability to critique and clarify their own practices and pedagogy. This text is so well-organized that each unit is somehow simultaneously self-contained and universally applicable; thus, wonderful professional conversations could be sparked simply by reading aloud any heading or paragraph in the presence of colleagues. Another strength is the listing of quality children’s literature in conjunction with lessons, activities and “big ideas” offered by the author. Throughout the book, there are numerous collections of both well-known and less-known top-quality children’s literature to accompany the reader’s attempt to put their newly-found approach into practice. Resources are conveniently separated by fiction, information and non-print media designations. An excellent resource for any classroom or support teacher seeking definition of and design for a “balanced literacy” program.